Shikar Burj Kund and building etc.[Bundi]. bl.uk > Online Gallery Home	> Online exhibitions	> Asia, Pacific and Africa Collections	> Shikar Burj Kund and building etc.[Bundi]. 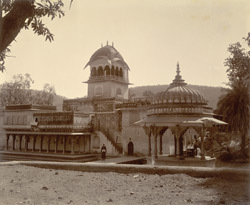 View of one of the palaces at Bundi, Rajastan by Gunpatrao Abajee Kale, c.1900. The photograph is from an album of views of Bundi formerly in the collection of Horatio Kitchener, 1st Earl Kitchener of Khartoum and Broome, (1850-1916), who was Commander in Chief of India between 1902 and 1909. The letterpress caption reads as follows: "Built by His Highness Maharao Raja Umed Singhji who abdicated in favour of his son at the age of 42; and having considered Shikar Burj a sacred place built there a residence etc, where he passed the remainder of his life in divine worship and retirement. Samvat 1832. AD 1775". The palace was later used as a hunting lodge.